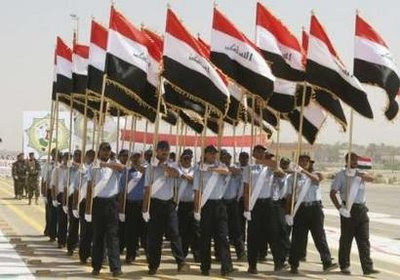 Diwaniya became the 10th Iraqi province out of 18 to take over security operations from the multi-national forces in Iraq. Baghdad-based newspaper on Thursday welcomed the security handover of Diwaniya province, describing the transfer as a “blessed step” to restore security and stability to Iraqi cities. Badr, the daily mouthpiece of Badr Organization, one of the main components of the Supreme Islamic Iraqi Council (SIIC) led by Abdel Aziz al-Hakeem said in article entitled, ‘Diwaniya…self-security,’ by Kareem al-Nouri, that the handover has proven the province’s ability to assume security responsibilities. On Wednesday morning, Diwaniya received its security file from the Multi-National Force (MNF) during a ceremony attended by National Security Adviser Muwafaq al-Rubaei and Diwaniya Governor Hamed al-Khudari. Bad weather conditions and logistic miscommunication problems between the central Iraqi government and the MNF delayed a power handover of the province, which was scheduled to take place in last June. Diwaniya, 180 km south of the Iraqi capital Baghdad, became the 10th Iraqi province to receive the security file from the coalition forces. In 2002, the population of Diwaniya was estimated at 420,000. The area around the province, which is well irrigated from the nearby Euphrates River, is often considered to be one of the most fertile parts of Iraq, and is heavily cultivated. The town is located on the main rail transport corridor between Baghdad and Basra. For birdwatchers, Diwaniya is a city with a rich bird list, as it has a wide range of biodiversity. The good news keeps coming… Iraq has achieved 15 of 18 benchmarks and violent attacks are down by 90% over last year. Al Qaeda in Iraq has been defeated. The Democratic government of Iraq will take over responsibility of al-Anbar, a province once reported as lost, in the coming days. Severe sandstorms prevented the transfer late last month of Qadisiya (Diwaniya) Province. 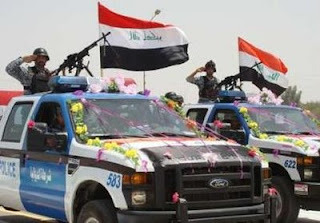 More… Armed and Curious attended the graduation ceremony yesterday at the Iraqi Military Academy in Rustimiyah and includes photos, via Instapundit.